The book is full of terms and references to authors, ranging from the fields of science to philosophy. This shows the profound thinking on the subject by the author. While it is easy to explain an idea from your own perspective, it is much harder to include other’s. The key message throughout the entire book is that you can’t predict the future. OK, thanks a lot monsieur Oostvogels! Did you have to read a book to realize that? Let me explain. In Agile, we stepped away from the idea that we can predict the outcome of a project with high accuracy. We realize that no matter how hard we prepare upfront, reality always turns out differently. This is exactly the message mr. Taleb is bringing to me in his book. If we transform this to a project context, I would call them blue mice. Sure they’re smaller, but nobody can predict them. All the other mice we know were brown, black or even white, but not blue! This can easily be translated to the events in a project. If you reflect for a minute, how many blue mice did you encounter in your professional life? How many small events had a big effect on your original plan? Maybe a leaking ceiling destroyed your development server? Maybe John had to leave the project for a week due to a family emergency? All these random events have an effect on the forecast we once made. Does that mean we should no longer forecast or plan? No, it doesn’t! I will try to translate Mr. Taleb’s advice to our blue mice. Don’t create single points of failure. Make sure knowledge is spread in your teams. Create back-up scenario’s for your infrastructure. Don’t detail out features too far in advance so that a shift in vision doesn’t cause a lot of investment loss. Enable your stakeholders to make decisions on how to deal with a blue mouse. Be open-minded. Grasp any opportunity to learn about your team, your customer, your end-users, … This will help you to spot blue mice much quicker. Let others create their big forecasts, but don’t place your bets on them. Keep your own forecasts small and adjust them regularly. Not all blue mice are bad. Some bring great opportunities. Ex. You learned from an end-user that your customer is shifting its vision and will require tools that are not in your product backlog. This can come as quite a shock, but at least you know! And chances are, you are the only one who knows. This information can be used to your advantage by adapting quickly and getting ahead of your competitors. You see, instead of trying to stick to a plan that is bound to get messed up, due to the random nature of life, we focus on what we want to deliver. The product backlog is in essence that exact focus. At the same time, we already know that the delivery will be impacted, due to blue mice popping up in the form of missing functionality, new opportunities, personal events, … But that’s ok! We have our focus and a mindset that acknowledges the uncertainty. The way we deal with it, is what makes the project succesful or not. 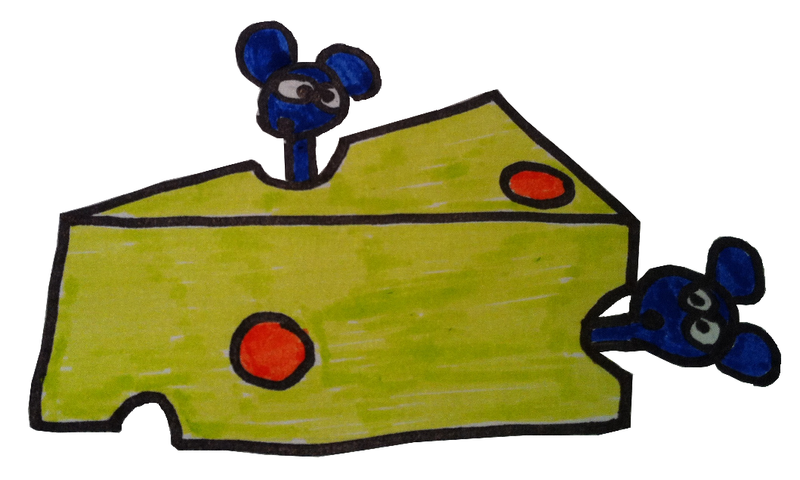 In an agile project, we have plenty of opportunities to spot a blue mouse. Thanks to the visibility and feedback loops on different levels (demo’s, retrospectives, planning meetings, daily standups,…) we can spot them early and present them to the decision makers on the project. The most important thing is that we don’t hide blue mice. Because if we do, they’ll eat our project from below, until it collapses. Now if you’ll excuse me, I seem to have a sudden urge for cheese!